The Trump Organization reportedly ordered replicas of the presidential seal to use at its golf courses despite laws against using the seal for financial gain, according to a report from ProPublica. ProPublica reports that the Trump Organization ordered dozens of 12-inch replicas of the seal for use as tee markers on Trump International golf courses from an Indiana-based company called Eagle Sign & Design. Eagle Sign & Design declined to comment on the report. "We're not discussing that, you can call the president," a representative said when reached by ABC News on Monday. The Presidential Seal on the podium, March 24, 2006, in Washington. The ProPublica report says that Eagle Sign & Design's owner confirmed that the company produced the replicas and that the client confirmed the design, but would not identify the client. President Trump often golfs at the Trump International Golf Course in Palm Beach, Fla., but the Trump Organization has at least three more golf courses known by the same name in Scotland, Ireland, and the United Arab Emirates, according to its website. ProPublica said its reporter reviewed an order form listing the customer as "Trump International" and received a photo from a source showing a table at Eagle Signs with numerous seals placed on top of it. The company's Facebook page has an album created 12 days ago described as "Trump International Golf Course" but as of Monday morning it did not publicly show any photos. 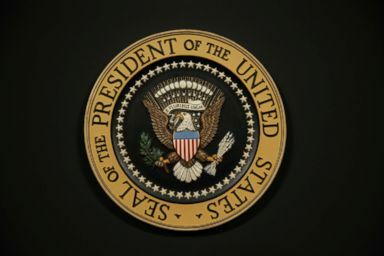 Federal law specifically says that the presidential seal cannot be used for any purpose that implies the endorsement of the federal government. The law says that anyone who knowingly manufactures or sells replicas of the seal can be subject to fines or up to six months in prison. 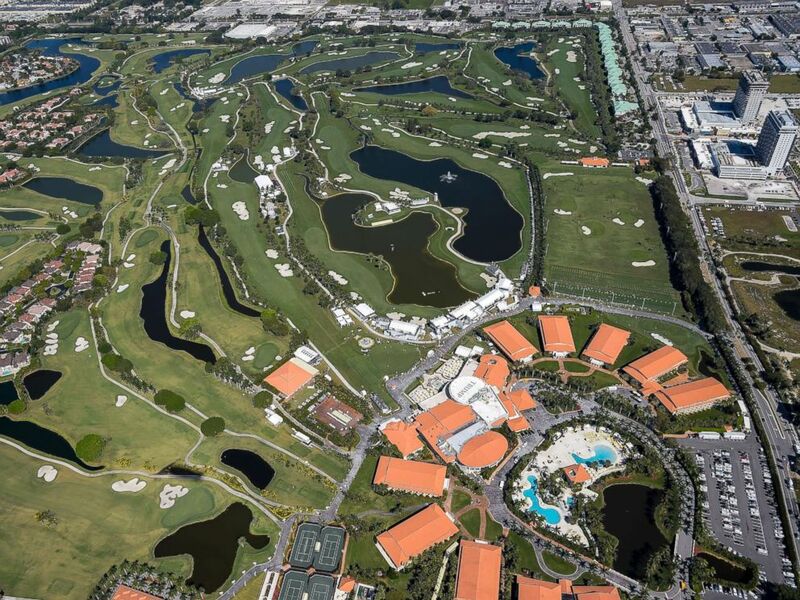 An aerial course overview from the MetLife Snoopy One Blimp during the second round of the World Golf Championships-Cadillac Championship at Blue Monster, Trump National Doral, March 4, 2016, in Doral, Fla.
A spokesman for the government accountability group Citizens for Responsibility and Ethics in Washington said that there have been examples of using the presidential seal for things like White House M&M's or personal golf balls that were given as gifts but the difference is that those items weren't being used by a business connected to the president. "The big deal is the commercial usage of it it doesn't have to be the product that's being sold, when its being used for the benefit of a private company and not the presidency that's an issue," said CREW's communications director Jordan Libowitz. He said that there will be questions about who authorized the purchase of the seals for the Trump Organization's golf course and how it was authorized. ABC News has reached out to the Trump Organization for comment.